and all ages of children and their families. Shows last about 45 minutes, but can be 30 mins for events such as Fun Days. If you have the space book a big show. If space is very tight, book a small show. All titles are available in both big and small versions. A big show is like a Punch and Judy show but twice as wide (about 2 metres by 1 metre deep ) the small show has a smaller footprint (about 1 metre by 1 metre). The playboard height is also much lower in the small theatre. 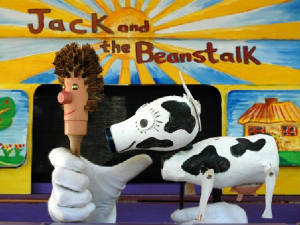 A small show is designed for smaller groups of smaller children - aged 3 - 6. The big show is suitable for children of 4 and over.